Tip: Scroll down if you want to read a transcription of the video instead. 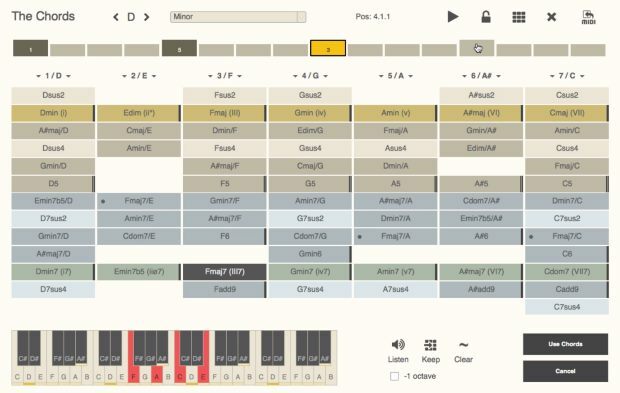 Sundog contains a built-in Preview Synth with 128 different instruments. However, you get the most out of Sundog by connecting it to your DAW with a virtual MIDI cable. If you know your DAW inside out you simply have to do this: Use a virtual MIDI cable to connect Sundog's MIDI Out to your DAW. Route Sundog's different MIDI channels to different channels of your DAW. Simple as that ;). This is the same text as in the video. You may want to read it if you want go through the tutorial step by step. 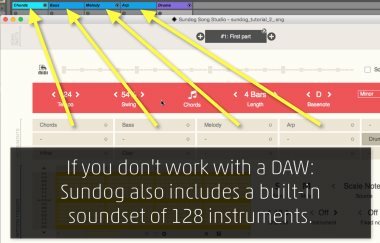 In this quickstart tutorial I want to show you how to use Sundog to build a song. Including chords, bassline, and melody. Sundog is a standalone software and you can connect it to any DAW or synth to create your melodies. In this tutorial,I use a virtual MIDI cable to connect Sundog to Ableton Live. Different Sundog channels are connected to different Ableton channels via MIDI. First, we pick a basenote and a scale. Sundog will use this information to make sure that your chords and melodies always stay harmonic. Pick one of the instrument boxes, then click on "Fill editor with basic sequence". Sundog will create a red line in the Pattern Trigger Editor. The box above will trigger the pattern below. You can draw lines to control the pitch of the pattern. Click on a pattern slot to add a note. And click twice to add a stop symbol ("#"). Sundog includes a big list of factory patterns. Click on "Pattern" and you will see them. You can click on items to hear a preview - and click a second time to stop. Let's continue with the drum kit. According to the MIDI standard the MIDI channel 10 is reserved for drums. Once again, click on "Fill editor with basic sequence". Then click on "Fixed note" and choose a bassdrum. I will do the same for the hihats and the clap. Let's take a look at the chords now. Pick an instrument and click on "Chords". What you see here is a matrix of chords of our scale. You can find triads in the upper part and four note chords in the lower part. Let's create a chord progression now. Click on the timeline slots and choose your chords. Click on "Use chords" when you are ready. Now all we have to do is clicking on "Follow the chords with this instrument". As you can see, the Source mode is set to "Full Chords" now. For our melody we used "Scale Notes". In "Full chords" mode the pattern will trigger all the chord notes at once. Next step: The bassline. Many basslines will focus on the lowest note of the current chord and play it back with a certain rhythm. So let's click on "Follow the chord notes with this instrument". Play it back.. and lower the octave a bit. 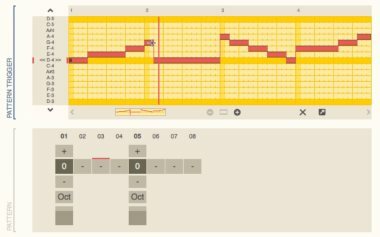 I will change the length to 8 and make a small pattern variation: Click on "Oct" with your left mouse button to transpose the note one octave higher. Or use your right mouse button to lower the octave. Our final step: Let's create an arpeggio. Click on "Follow the chord notes". The Source mode is set to "Chord Notes" now. This means that the zero in the pattern will play back the first note of the chord. The one will play back the second note, and so on. In the end, we can simply export our song to the DAW via drag and drop. Pick the small MIDI symbol and drag it to the DAW. There's a lot of other stuff that Sundog can do for you. Just take a look at the other tutorials and check out the manual. Sundog contains a built-in page which points to an online and an offline help. Just click on the logo in the main view to get there. You can finde the online manual here. If you need an offline PDF, you can get it there, too. Also take a look at the included example songs.